QTUM is definitely one of the projects everyone should be keeping their eye on. 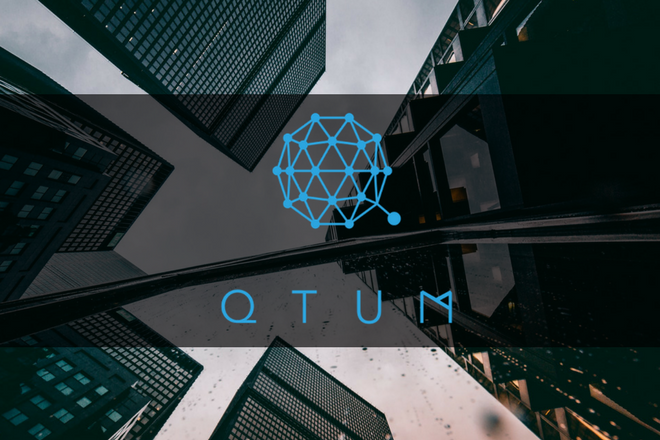 Qtum (pronounced Quantum) is an open-sourced value transfer platform which focuses on mobile decentralized apps or dapps. Qtum is meant to be is a bridge between Bitcoin and Ethereum functionalities: Bitcoin was designed to be a value transfer program, while Ethereum primarily a smart contracts platform. Qtum is a hybrid of the two, a value transfer protocol which can also support dapps and smart contracts. It is being developed by the Qtum Foundation, based in Singapore. In March 2017, Qtum launched a crowdfunding campaign to seek funds for the development to their new blockchain-based platform. The crowdshare was scheduled to last 30 days, or until all tokens were sold. Qtum sold over 10 million dollars’ worth of its tokens after only 90 minutes, eventually raising a total value of $15.7 million before stopping the campaign early after only 5 days. 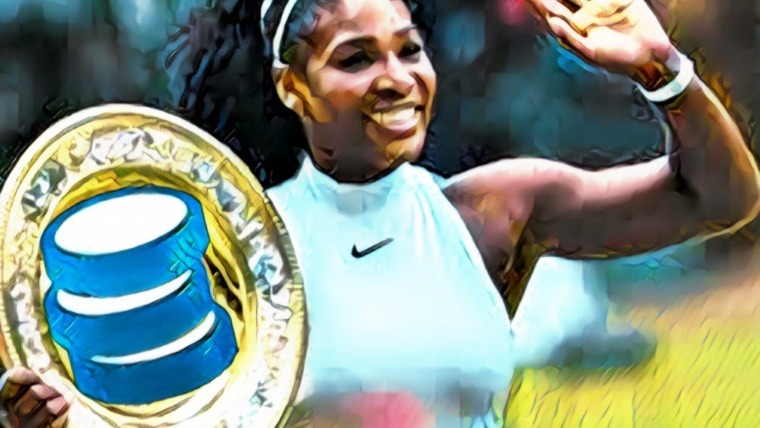 They raised a total amount of 11,156.766 bitcoins (BTC) and 77,081.031 ether (ETH) in exchange for the 51 million Qtum tokens being distributed to the public. It was the 18th highest crowdfunded project of all time. As described in Qtum’s whitepaper, 51% of the coins were distributed to the public via the crowdfunding campaign. 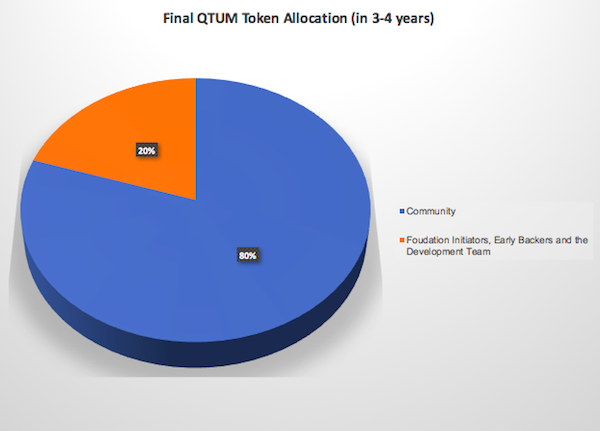 Of the remaining 49%, 29% of the coins would be allocated as community incentives, and the remaining 20% would be distributed to the early backers and development team. 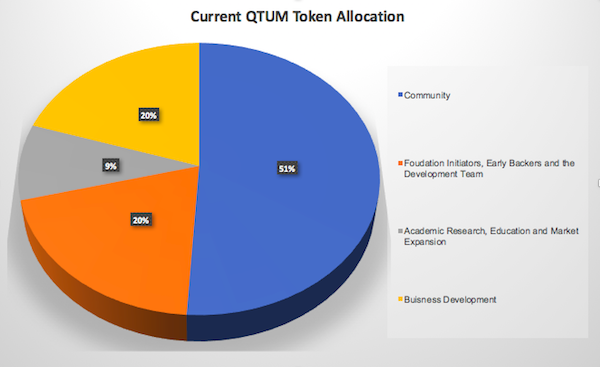 This allocation will transition over the next few years to its final allocation of 20% to the backers and team and 80% to the community. The Qtum software itself is a hybrid fork of the Bitcoin core and an account abstraction layer which allows it to run with other virtual machines such as the Ethereum Virtual Machine (EVM). Qtum was designed to integrate the best parts of the Bitcoin and Ethereum platforms into a business-friendly blockchain. Combining a modified Bitcoin Core infrastructure with an inter-compatible version of the Ethereum Virtual Machine (EVM), QTUM merges the reliability of Bitcoin’s unfailing blockchain with the endless possibilities provided by smart contracts. A smart contract is a computer program that is capable of facilitating, executing, and enforcing the negotiation or performance of an agreement (i.e. contract) using blockchain technology. Think of it like a small program that can be set to automatically execute some pre-defined action. For instance, you could set a title of a car or house to automatically be transferred from one party to another, after an agreed upon amount has been paid. This would in effect remove the need for an escrow or a trusted third party to ensure that both sides get what is agreed upon. To learn more about smart contracts see: “Digital Assets and Smart Contracts: A Beginner’s Guide“. Qtum is the world’s first Proof-of-Stake (PoS) smart contracts platform. Qtum aims to be the world’s premier smart contract platform and is focused on mobile development software. The problem with the Proof-of-Work model (the system implemented by both Bitcoin and Ethereum) is that it requires a large amount of CPU usage and therefore energy consumption which in turn leads to high transaction costs. It is estimated that globally both Ethereum and Bitcoin burn US$1,000,000 in energy costs per day! This is a problem Ethereum and Bitcoin are both scrambling to fix. This is a factor which has lead to Ethereum software forks in the past. 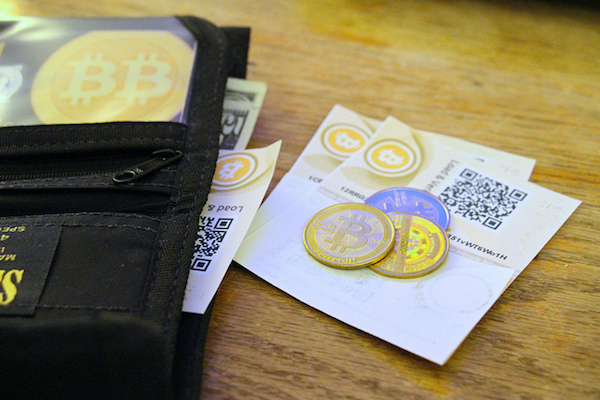 In comparison, the PoS system determines who will be awarded the block (the reward for mining) based on staked coins and other factors which promote the holder of the coins to be a part of the blockchain, with less amount of waste. 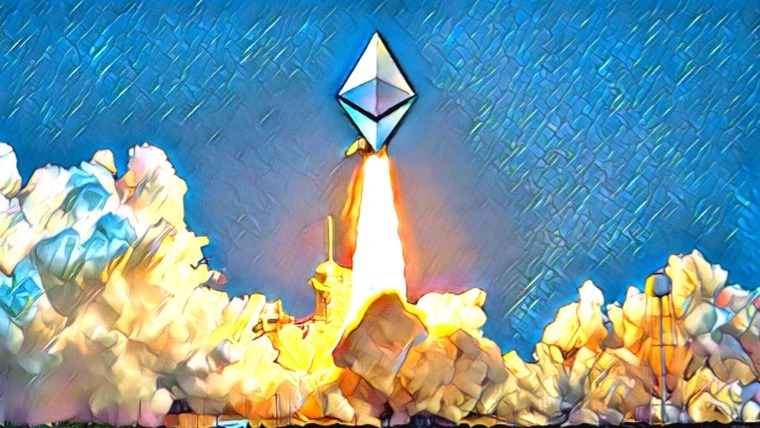 Ethereum aims to become the universal platform for Smart Contracts and dapps. However, as explained in the Qtum Blockchain Economy Whitepaper, Ethereum has some technical implementation challenges which Qtum looks to solve. One of these issues is that currently a user needs to have synchronized the entire blockchain (which is around 30gigs) in order to use an Ethereum software-based dapps. This is a big problem for devices with small amounts of storage or low bandwidth and is potentially leaving out a percentage of the mobile market. Today about half of all total internet traffic in the world comes from mobile devices. With the number of smartphone users predicted to increase from its current estimation of 2.1 billion people to 2.87 billion by 2020, having a “killer app” is a critical element to the mass adoption of blockchain and can’t be neglected. Another problem Qtum is addressing is the relative limited functionality Ethereum has. For an Ethereum smart contract to execute, the trigger for the sequence to begin has to come from inside of the blockchain itself. This normally works great but it also has some issues. Not everyone will likely be using Ethereum in the future, and even so there are some things which can’t be captured onto the blockchain. Qtum looks to improve on this by implementing what Patrick Dai calls a “Master Contract”. Qtum is making it possible to use triggers from outside the blockchain to initiate contracts. This will make their platform much more useful and adaptable to the real world. Compatibility of differing blockchain technologies. For example, Bitcoin’s UXTO and Ethereum’s Account models are not inherently compatible. Qtum has assembled a strong development team and a powerhouse list of angel investors. Their team members have worked at large organizations such as Alibaba, Nasdaq, Tencent and Baidu. Jordan Earls – Co-founder and lead developer. Earls is a well-known member of the cryptocurrency community and has been developing software since he was 13. 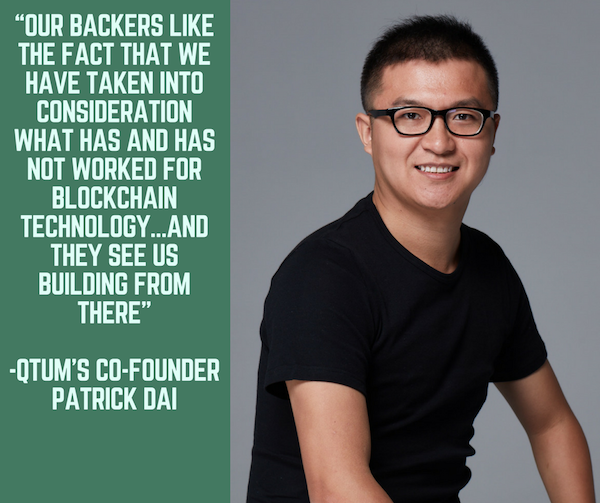 Patrick Dai – Co-founder. Dai did his undergraduate studies at Draper University and earned a Masters degree from the Chinese Academy of Sciences. He was previously employed by Alibaba. Neil Mahi – Co-founder. Mahi has over 20 years’ experience developing software and has four years’ experience in the blockchain space. Qtum has also has an impressive list of angel investors such as Anthony Di Iorio (founder of Ethereum and CEO of JaxxWallet), Chen Weixing (billionaire and founder of Kuaidi), and Jeremy Gardner (co-founder of Augur). It is always a promising sign when industry leaders give funding to a start-up. A full list can be found on their About page. Qtum is not without challenges. Two of its main competitors, Ethereum and NEO are currently the #2 and #7 coins by market cap respectively. 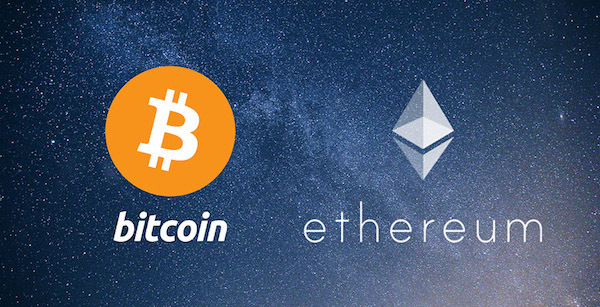 Both of these coins have seen tremendous growth recently and are powerhouses in the cryptocurrency world. In addition, these coins are backed by an experienced development team and a strong community of followers supporting their growth. We believe that we have some of the best technology in the industry given that more than 10 DAPPS plan to build on Qtum and we just launched the main network, Ignition, last month. 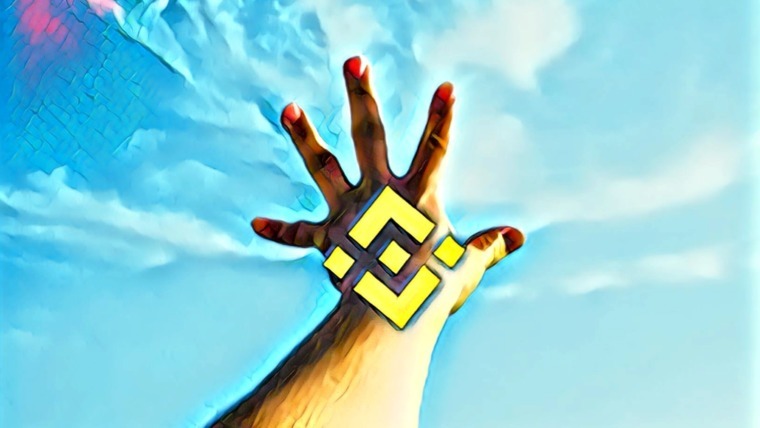 Right now we are the first proof-of-stake smart contracts platform, which is a huge achievement given this seems to be where the trend is going. Even so, Qtum has a way to go before the dApps are ready for market use. It is worth mentioning that one of the co-founders, Patrick Dai, was accused by a former associate of having been involved in a Bitbay related scandal. Articles on Github and Smith and Crown have addressed these allegations, concluding that there doesn’t appear to be any evidence to support these claims. Furthermore, the list of angel investors backing the project and QTUM’s stance to implement industry compliance standards only goes to further disprove these claims. QTUM can be bought on various exchanges, such as Korean based Coinone, Bittrex, and Binance. QTUM has a OSX, Windows and Linux wallet available for download. Qtum plans to release a mobile wallet app soon which will allow you to not only store your coins, but will also allow you to stake your coins from the wallet. And if you’re worried about security, some info on encryption and backing up your desktop wallets can be found on this site. It is also possible to stake your coins easily. To do so simply download the Qtum core wallet and sync to the network. Your coins will automatically stake as along as you keep the blockchain up to date. More info can be found on a community post here. Qtum is an innovative platform with a huge potential reach of clients. 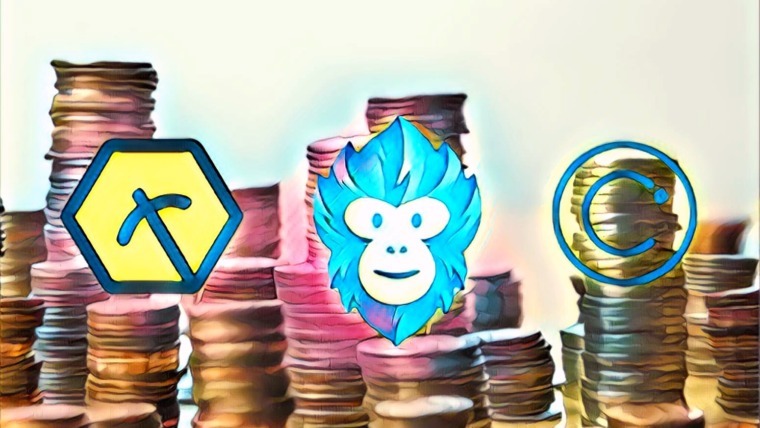 Its push to implement decentralized mobile apps (dapps), in addition to being the world’s first Proof-of-Stake (PoS) smart contract platform, is unique and gives the program a potential edge over its competition. Thanks to its compatibility with the Ethereum and Bitcoin gateway, having an experienced development team and an impressive list of investors and capital, Qtum is in an interesting position and has all of the ingredients to be successful. But in this ever-changing world of cryptocurrencies and with serious competitors at its heels, whether or not Qtum is actually able to succeed at what they have set out to do is anyone’s guess. That being said, they have laid the groundwork for big things moving forward. Qtum is definitely worth keeping your eye on. For more reading on Qtum see: “7 Projects on QTUM to Get Excited About” and “Qtum: Full Steam Ahead in 2018“.